The 3M Brand Professional Audio Recorder was manufactured by the Mincom Division of the 3M Company in Camarillo, California. It fulfills a requirement in the professional recording industry for the ultimate quality in tape recording. The continued improvements in records, tapes, and playback equipment revealed deficiencies in original master recordings. The 3M Brand Professional Audio Recorder overcomes these problems and provides improved master music tapes -- improvement readily discernible by ear. This new tape recording system has been developed by 3M engineers to fulfill the requirements of critical recording studios for improving the quality of master music tapes. Continuing improvements in playback equipment and in records and tapes have revealed deficiencies in original mastering equipment; the 3M Professional Mastering System overcomes these problems, providing improvements you can actually hear. The 3M Professional Mastering System affords significant improvements over present recording equipment in three areas. Perhaps most important is a major improvement in signal-to-noise ratio, an increase of up to 15 db. The second area of improvement is a new tape drive system that reduces flutter to half that present in other tape transports. Thirdly, the entire system affords an operating and editing ease unmatched by any other tope recorder. Another important improvement which is not readiily discerned is an increase in long-term reliability, due to the exclusive use of silicon transistors throughout the electronic assemblies, plus the simplified tape drive system. Without a doubt, the new 3M Professional Mastering System is a landmark in the history of magnetic recording, setting entirely new standards of quality, especially in the recording of music. Whiile complex in concept, it is surprisingly simple in operation. It actually reduces the problems of the recording engineer while vastly improving the results. Three different models of the 3M Professional Mastering System are available. Specifications and operating instructions apply basically to all three, as the only difference is in the number of tracks recorded and the number of electronic assemblies. Model #1 is a single channel, 2-track monophonic recorder using standard 1/4" tape. Model #2 is a 2-channel, 4-track stereophonic recorder using 1/2" tape. Model #3 is a 3-channel, 6-track recorder for recording multi -channel stereophonic or stereo and monophonic signals simultaneously. Model #1 or #2 can be easily converted to record additional channels. ﻿Foundational text courtesy of Revere-Minicom Division 3M Company. "The original Dynatrack-only machines (only 6 were delivered to customers) used 2 70 mil tracks per channel. 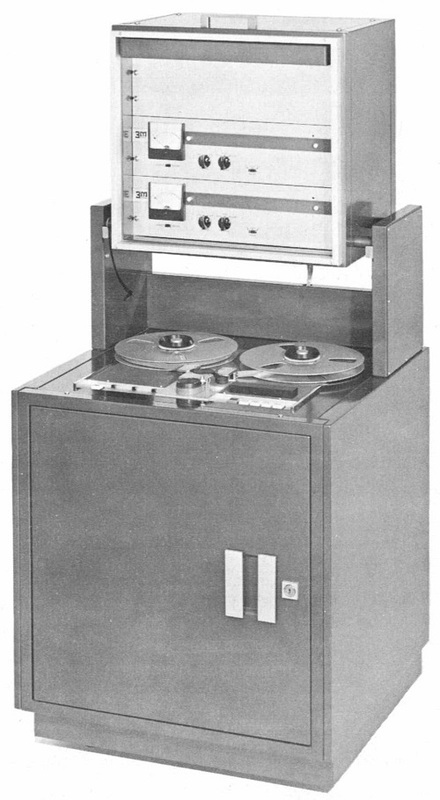 A stereo machine was 1/2" 4-track, and a 3 channel machine was 3/4" 6-track. In 1964, when these machines were delivered, 3-channel was very common and overdubbing wasn't too common. Do you have content, to add, about the 3M Professional Mastering System or associated topics? Please feel free to Share it, here!